Kuala Lumpur, 28 May 2017 – The dire straits of the Sumatran rhinoceros which is on the brink of extinction, especially with the devastating news of Puntung, should be a lesson for all. Yayasan Sime Darby (YSD) Chairman Tun Musa Hitam, who expressed his regret and sorrow about Puntung’s terminal condition, said those related to the conservation efforts should reflect on the present situation. “After spending so much time and funding to conserve the Sumatran rhinoceros since 2009, I regret that it has come to this and let this be a lesson to all those related to the efforts as well as the world at large. “This is a very sad development. Future generations would certainly blame us for failing to save this species from extinction,” Tun said. 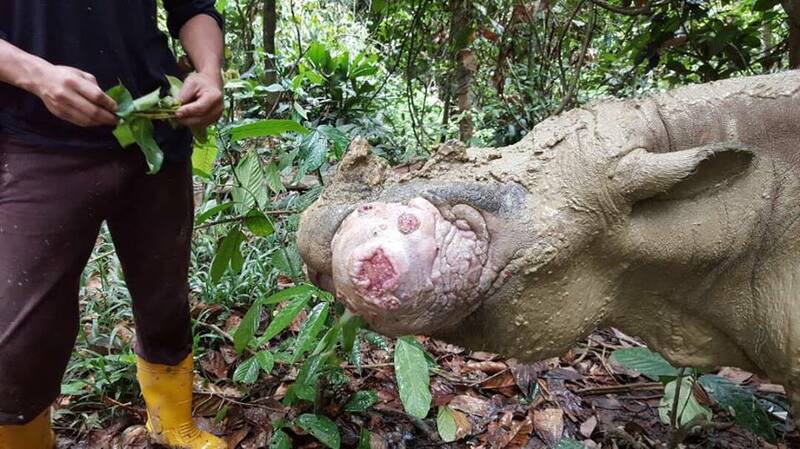 Puntung, one of the three remaining Sumatran rhinoceros in Malaysia, is suffering from a squamous cell carcinoma in her left cheek. It is learnt that the cancer is spreading rapidly and Puntung will not survive much longer, even with treatment. The state government has authorised euthanasia on Puntung, after deliberation with experts. YSD had worked with the Borneo Rhino Alliance (BORA) and the Sabah Wildlife Department (SWD) to save the Sumatran rhinoceros in Sabah over the past eight years up to February this year, including the rescue, translocation and care of Puntung, with an allocation of RM13.8 million. With Puntung’s death imminent, there will only be two Sumatran rhinoceros left in Malaysia. According to BORA Executive Director Dr John Payne, as of yesterday, Puntung can no longer breathe through her left nostril nor vocalise. She is in pain and her condition is declining rapidly. “This is devastating news for all of those who have been involved in Puntung’s life over the past ten years, from those in SOS Rhino who monitored her wild in the Tabin forests since 2007, those who captured her in 2011 and those who cared for her daily and still care for her right up to now,” he said. “We thank the countless people, both in Malaysia and overseas, who worked endlessly with us in April, including financial support for the dental surgery and follow-up work. “We would like to record our profound thanks to YSD, which has been our biggest supporter and donor since 2009. YSD has not only provided the financial funding covering the costs of monitoring, capture, translocation and care of Puntung since 2009, but its council members and management team, headed by Tun Musa, have maintained a constant personal interest in her welfare and progress,” Dr Payne said. He added that BORA’s staff, who have had Puntung under intensive care over the past two months, have been shocked by the very visible rapid growth in the size of the carcinoma. The BORA team has been in constant contact with experts in Europe, South Africa and Thailand and have concluded from the discussion that any form of conventional treatment would just prolong Puntung’s agony. Dr Payne also said BORA is preparing to try and recover eggs or oocytes from Puntung, representing hope that she may yet be able to contribute to the survival of her species. From 2009 to February 2017, YSD had spent RM13.8 million towards conserving the Sumatran rhinoceros, with funds channelled towards an artificial reproductive technology (ART) programme to help breed the Sumatran rhinoceros and help save the species from extinction. Currently, the Borneo Rhino Sanctuary at the Tabin Wildlife Reserve is caring for two female Sumatran rhinoceros – Puntung and Iman – as well as a male rhino – Tam. Since 2009, YSD has committed RM131 million towards the protection of high conservation value ecosystems, vulnerable and endangered species as well as initiatives promoting the preservation of the environment and biodiversity.